Catalpa bignonioides is a tree sometimes known as Indian Bean Tree. It is native to the southeastern United States where Europeans first found the tree growing in the fields of the Cherokee tribes who called it Catalpa. Its vitality enables it to flourish almost anywhere in the United States and southernmost Canada, making it suitable for UK climates. Planting a Catalpa is a bold textural statement with four to eight inch leaves giving it a wonderfully vivid texture. In mid summer when few other trees are flowering it produces foxgloves like white flowers up to twelve inches long. These flowers are remarkably showy and beautiful, from a distance resembling white bouquets covering the tree. The white flower has a purple throat with yellow spots over a frilly petal and these grow in clusters. These flowers make Catalpa one of North America's showiest native trees and a worthy addition to any garden. 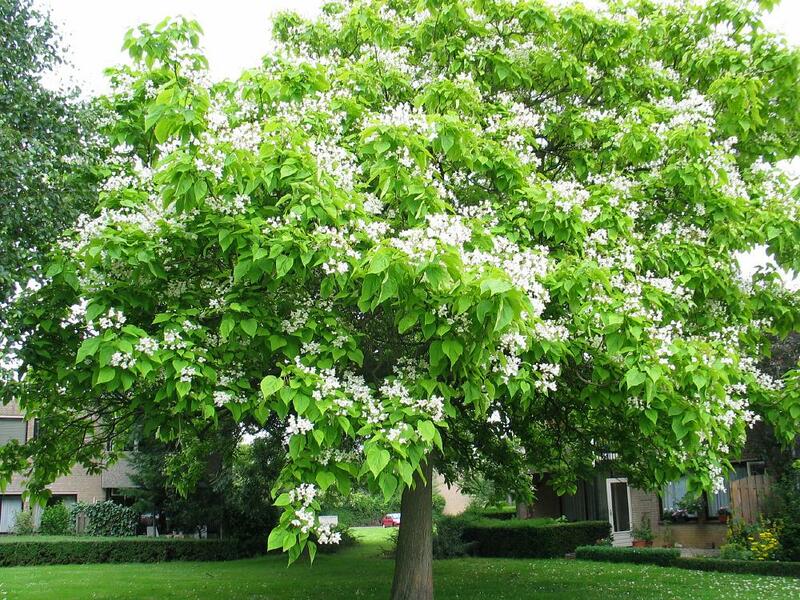 Catalpa grows 40 to 50 feet tall and can spread at most to 30-40 feet. It is robust performer, being drought tolerant and having the ability to withstand poor soil and pollution.